The Denton County Transportation Authority (DCTA) says A-train service remains suspended Monday due to high water; service to be partially suspended service on Tuesday. A southbound and northbound express bus bridge offering service from the Downtown Denton Transit Center, and MedPark Station, to Trinity Mills Station. A southbound and northbound local bus bridge that will service all A-train rail stations from the Downtown Denton Transit Center to the Trinity Mills Station. DCTA will operate all standard bus service. 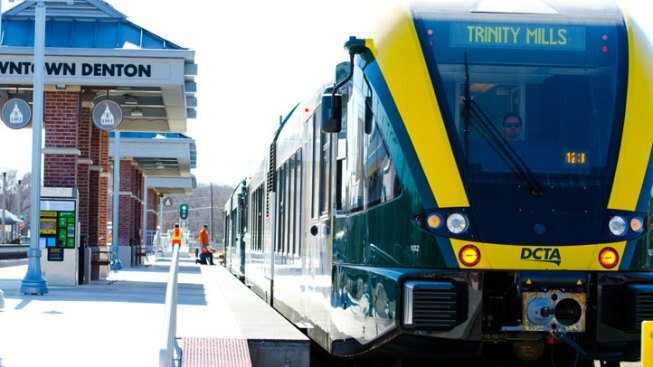 DCTA has established a southbound and northbound bus bridge that will service Old Town Station in Lewisville to the Trinity Mills Station in Carrollton. All bus bridge services will pick up and drop off near the platform at each station. DCTA representatives will be on site to assist with this process and address passenger questions. Passengers should expect to use the bus bridge services moving forward until further notice. DCTA encourages passengers to seek alternate modes of transportation during this time. Current conditions will be monitored regularly to determine any necessary service modifications for the safety of passengers and DCTA employees. For more information on DCTA's service during the inclement weather, passengers are encouraged to sign up for Rider Alerts or contact customer service at 940-243-0077.